Zola Jesus - Wiseblood (Johnny Jewel Remixes). Vinyl LP. Bleep. Nika Roza Danilova - AKA Zola Jesus - revisits two standout tracks from 2017’s wintery masterpiece Okovi, with assistance from musician and composer Johnny Jewel of synth-pop heavyweights Chromatics. In the remixing style of 1980s maxi singles, these alternative renditions of ‘Ash to Bone’ and ‘Wiseblood’ take Danilova’s thunderous vocal and sets it against chattering textures, big room drums, and Jewel’s ubiquitous synth mastery. 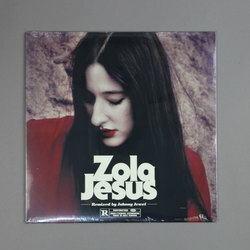 You may have heard Zola Jesus before, but not quite like this.